Is Orville the Flying Cat Art? Or is “Orvillecopter” Just a Stunt? What do you do when your cat dies? Bury it? Well, if you’re Bart Jansen, a Ditch artist, then you stuff it, stick some motors and proprellers on it, and turn it into a piece of art. That flies. And is a dead cat. 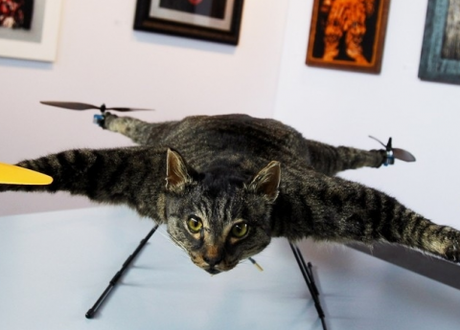 Jansen priced his cat helicopter at £8,000, reported The Telegraph, and put it on display at the KunstRai art fair; but now its value has gone up. A lot. It’s now estimated at 100,000 euros, according to his dealer, Geoffrey van Vugt. It’s caused a lot of hoo-hah. Jansen said he wanted to turn his cat into a helicopter because it had been named after one of the Wright brothers (who built the first plane.) Orville’s brother, Wilbur, is still alive. The Los Angeles Times said that Jansen had kept Orville in a freezer for six months; had him stuffed; put propellers on each paw, and a remote control engine in the stomach – and then achieved lift off. The Kunstrai show, said Abigail R Esman on Forbes, shows mostly “mediocre at.” But those complaining about it obviously know “very little” about art – what about Damien Hirst, with his dead cows and butterflies; Wim Delvoye’s tatooed pigs; Josephy Beuys’ dead hares, and Maurizio Cattelan’s suspended horse? And Chsristian Loubutin, the shoemaker, works with dead animals as well. There’s “nothing particularly novel about Orville.” Lisa Black has been making animals into machines for years. So is his work art? We must look at his own aesthetic. He says he makes machines that automate a function, but are not necessary. By those standards – it is art.